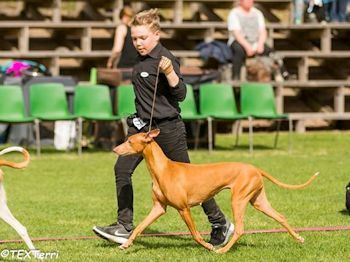 Enzo, Northgate's Forever N Ever, BOB-veteran and Swedish Veteran Winner 2017! 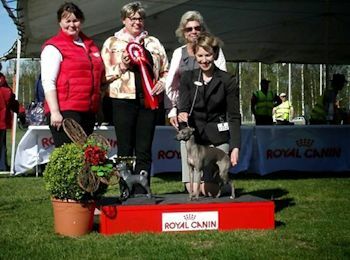 Judge Mrs. Ingela Kyrklund. 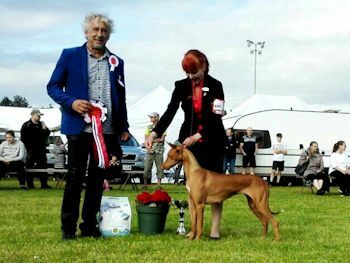 (judge Mr Mark Cocozza, UK). Sergei was BM-2 on Friday. 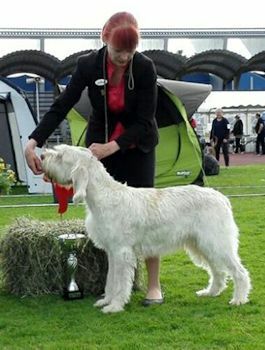 Northgate's was BOB-breeder on Friday & Sunday. 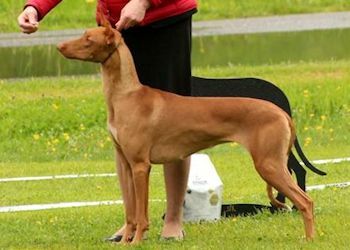 BOB CC cacib BIG-2 NCM's All That Glitters Is Gold At Northgate "Glitter"
BB-2 Northgate's Rock Princess "Roxy"
BB-4 Northgate's Northside Special "Britney"
BOS cacib Northgate's Rock The World "Sergei"
BM-2 Northgate's Prince Charming "Manu"
Northgate's Pharaoh Hounds were BIS-3 breeders Group! Judge Mrs Barbara Muller. 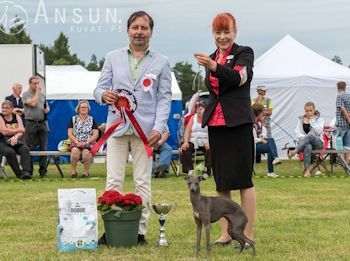 Italian Greyhound Stella, Ch Dervisch Sixteen Shades of Blue was BOB, judge Mrs Teija Urpelainen, Finland. 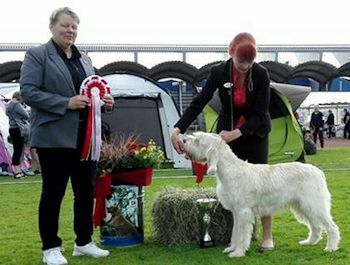 Spinone Riipi, Fragola Tempesta Dineve, was BOB & BOB-veteran, judge Mr Marko Lepasaar, Estonia. 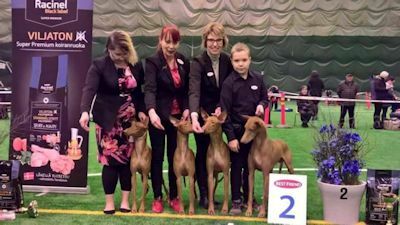 BOB CC BIG-2 NCM's All That Glitters Is Gold At Northgate "Glitter"
BB-4 Northgate's Read All About It "Kaiku"
BOS Northgate's Rock The World "Sergei"
BM-3 BOB-veteran Northgate's Forever N Ever "Enzo"
Spinone Riipi, Fragola Tempesta Dineve, was BOB & BOB-veteran, judge Siv Sandö. 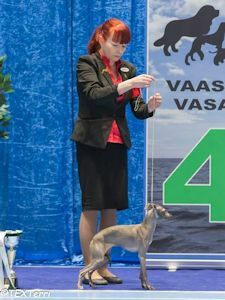 Italian Greyhound Stella, Ch Dervisch Sixteen Shades of Blue was BOB, judge Mrs Liz-Beth Liljeqvist, Sweden. 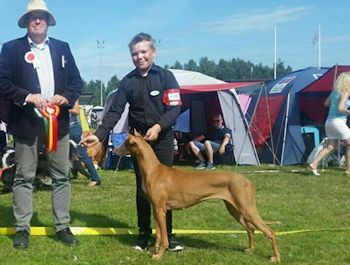 BOB CC cacib BIG-4 Ncm's All That Glitters Is Gold At Northgate "Glitter"
BB-2 res-cacib Northgate's Read All About It "Kaiku"
BOB, BOB-veteran BIG-1 Fragola Tempesta Dineve, breed judge Mrs Marjo Nygård, group Mr Lars Widen. BOB cacib Dervisch Sixteen Shades of Blue was BOB, judge Mr Gerard Jipping. 1. CC 470 points NCM'S All That Glitters Is Gold At Northgate "Glitter"
2. 430 points Northgate's Prince Charming "Manu"
3. 211 points Northgate's Rock The World "Sergei"
4. 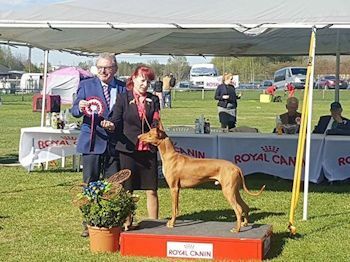 200 points Northgate's Rock Princess "Roxy"
BOS cacib CC NCM'S All That Glitters Is Gold At Northgate "Glitter"
BB-2 Northgate's Rumours and Gossip "Naga"
BOB cacib BIG-2 Dervisch Sixteen Shades of Blue "Stella". BOB CACIB Dervisch Sixteen Shades of Blue, judge Mr Markku Moilanen, Spain. 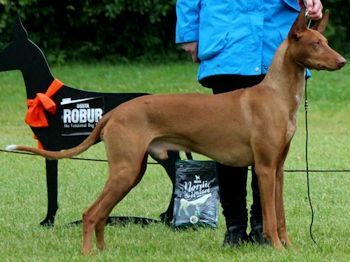 BOB & BOB veteran, BIG-1, BIS-4 "Riipi" Fragola Tempesta Dineve, breed judge: Mrs Annukka Paloheimo. 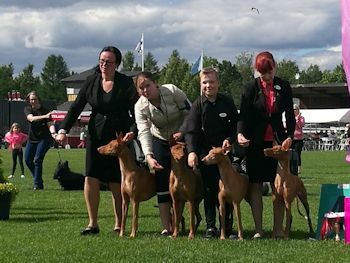 BIS-3 breeder Northgate's Pharaoh Hounds, judge Mrs Päivi Eerola. 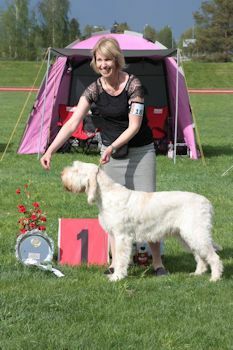 BB-2 CC NCM'S All That Glitters Is Gold At Northgate "Glitter"
BB-3 Northgate's Red Riding Hood "Redi"
COURSING CHAMPION! 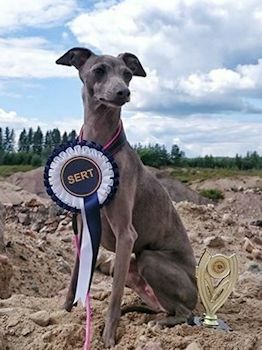 She surely is a dual purpose Italian Greyhound! 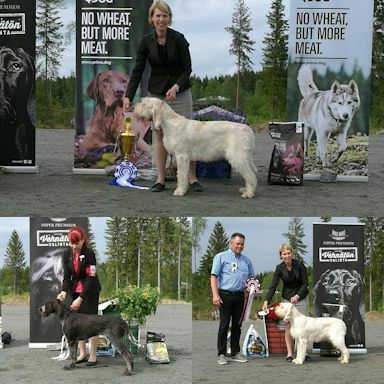 BOB CC new Finnish & Swedish Champion Northgate's Rock Princess "Roxy"
BB-3 BOB-veteran Northgate's Heavens I'm Hot "Nealah"
BOS Northgate's Prince Charming "Manu"
BM-2 BOS-veteran Northgate's Dom Perignon "Skumpan"
BOB Northgate's Prince Charming "Manu"
BOS Northgate's Red Riding Hood "Redi"
At the group finals (huge combined FCI groups 5/8) Manu was placed as BIG-4!! 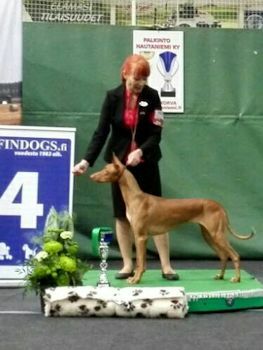 BOB BIG-1 Northgate's Rock The World "Sergei"
Best In Show breeder Northgate's Pharaoh Hounds. Lovely photo by Jin Kaakinen. 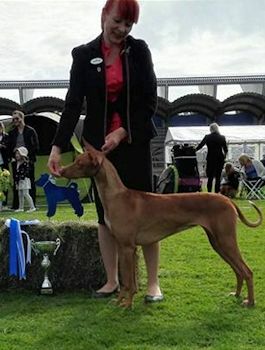 Pharaoh Hounds were judged by Mrs Marja Talvitie, her BOB was "Redi" Northgate's Red Riding Hood! 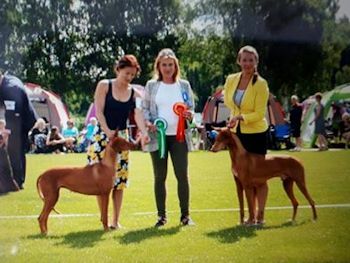 Spinone Riipi, Fragola Tempesta Dineve Best In Show Veteran & Best In Group!!! 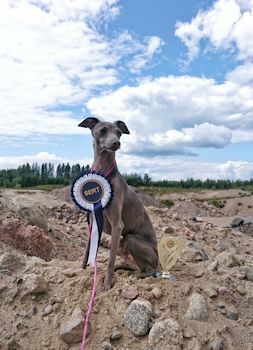 Italian Greyhound Stella, Dervisch Sixteen Shades Of Blue BOB. 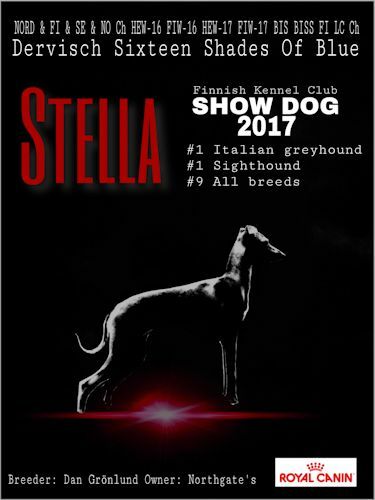 Stella, Dervisch Sixteen Shades of Blue Best In Group! 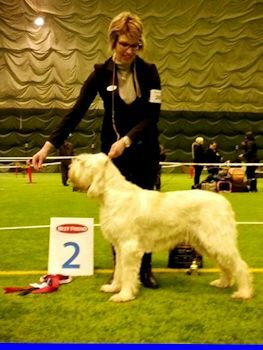 Connolly, Ireland (breed & group) and Mrs Janelle Robbins, Australia (BIS veteran)! 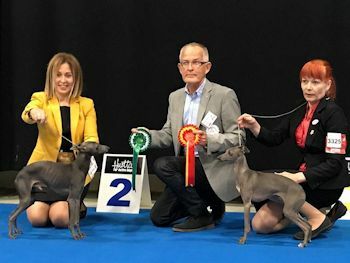 Italian Greyhound Stella, Dervisch Sixteen Shades of Blue BOB & BIG-1! 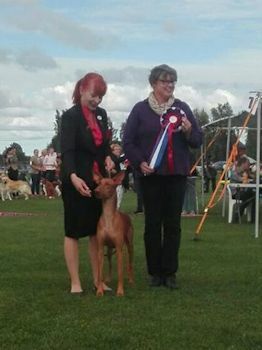 Judge Mr Jouko Leiviskä. Spinone "Riipi" Fragola Tempesta Dineve BIG-2! BIG-2! IG "Stella" Dervisch Sixteen Shades Of Blue BOS. 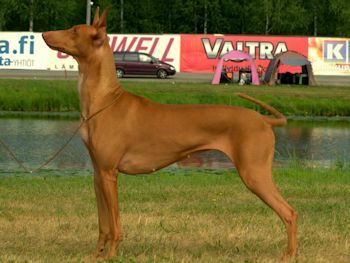 PH Sergei, Northgate's Rock The World BOS. 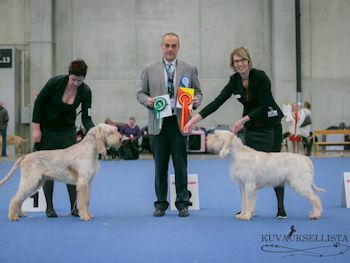 BIS-2 veteran & BIG-4 spinone FRAGOLA TEMPESTA DINEVE "Riipi"
GWP Rikurovan Iira BOB, cacib and new C.I.B and C.I.E. IG Dervisch Sixteen Shades of Blue first with CC!! "Stella" Dervisch Sixteen Shades of Blue won LC competition with a CC! BIG-3 Ch Fragola Tempesta Dineve BIG-4 Ch Rikurovan Iira. 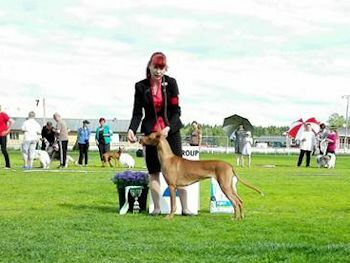 Thank you Mrs Pirjo Aaltonen! 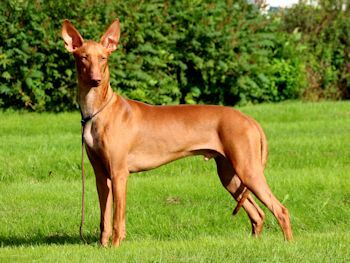 BOB Northgate's King of the Ring "Qezo"
BM-3 Northgate's Rock The World "Sergei"
BB-4 NCM's All That Glitters Is Gold At Northgate "Glitter"
Best In Show breeder Northgate's Pharaoh Hounds. Thank you Mr Alberto Lamperti! 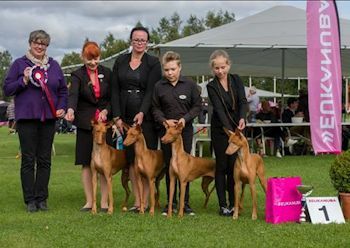 BOB CC cacib NCM's All That Glitters Is Gold At Northgate "Glitter"
BB2 Northgate's Rock Princess "Roxy"
BM2 Northgate's Qing of the North "Aku"
At The Group finals Glitter BIG-2, Stella BiG-2 and Northgate's Pharaoh Hounds BIS-3 breeder! Thank you Mrs Inga Siil, Mr Hadisavvas Savvas, Mr Theo Leenen & Mrs Monika Blaha! 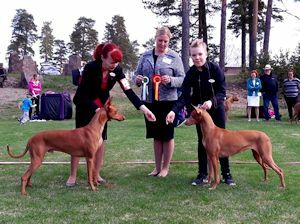 BIS-4 breeder Northgate's Pharaoh Hounds, judge Mr Johan Juslin. 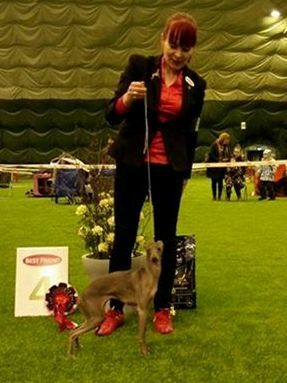 BOB BOB-veteran Northgate's Forever N Ever "Enzo"
On Saturday Stella, Dervisch Sixteen Shades of Blue, was BOB with CC & Cacib. 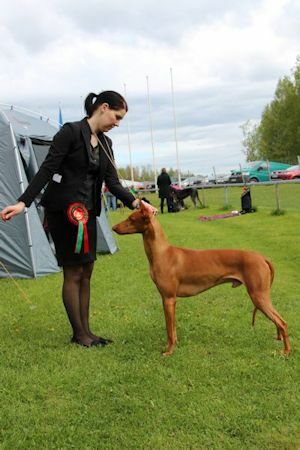 Judge Mrs Hannele Jokisilta. 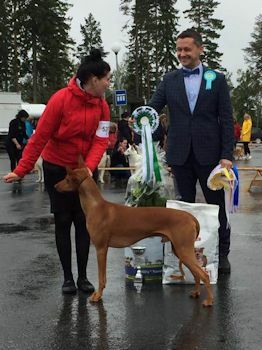 GWP Rikurovan Iira BB-2, judge Mr Kurt Nilson. 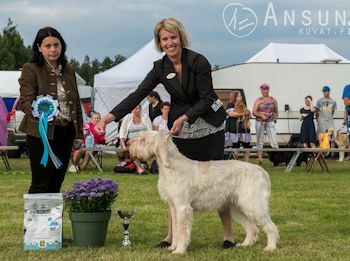 Spinone Fragola Tempesta Dineve BOB & BOB-vet, judge Mr Kurt Nilson. 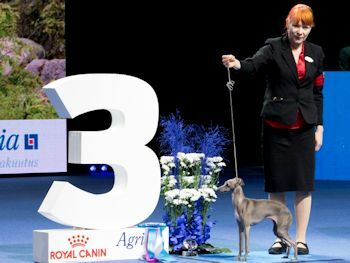 At the group finals Mrs Nina Karlsdotter placed Glitter as BIG-3! Muumi, Northgate's Red Rabbit Hunter, BIG-2! 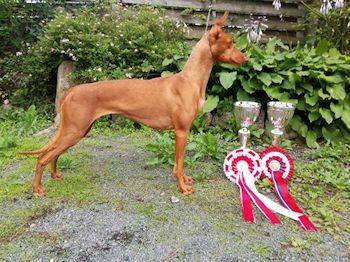 BIS open BM2 Northgate's Rock The World "Sergei"
BIS working dog BM3 Northgate's Forever N Ever "Enzo"
BM4 Northgate's Prince Charming "Manu"
BB5 Northgate's Red Riding Hood "Redi"
BOB CC cacib EEW-17 Northgate's Rock The World "Sergei"
BOS CC cacib EEW-17 Northgate's Rock Princess "Roxy"
BM-2 BOB-veteran Northgate's Forever N Ever " Enzo"
BOB CC BIG-3 Northgate's Read All About It "Kaiku"
Breed judge Mr Markku Kipinä, group Mrs Mari Lackman. 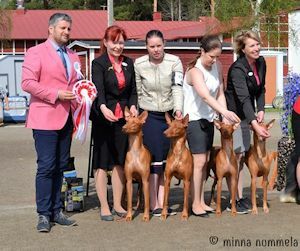 Baltic Winner 2017 Northgate's Red Riding Hood "Redi"
BIG-2 BOB Cacib CC Northgate's Rock The World "Sergei"
Thank you Mr Karl-Erik Johansson (breed) & Mr Peter Machetanz (group)! 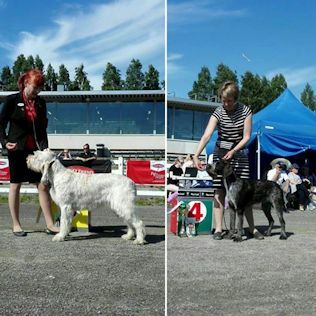 Thank you Mrs Paula Rekiranta (breed and group) and Mrs Saija Juutilainen (Best In Show)! BB-2 CC NCM's All That Glitters Is Gold At Northgate. 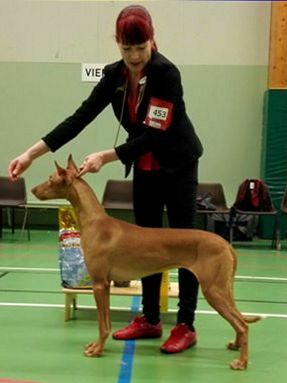 Breed judge Mrs Tanya Ahlman-Stockmari, group Mr Jo Scheper from the Netherlands. 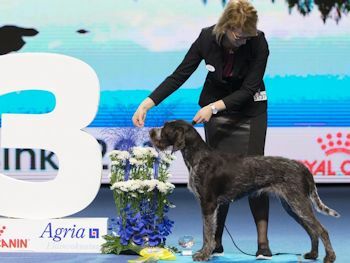 BOS cacib Dervisch Sixteen Shades Of Blue "Stella". Judge Iris Urschitz, Austria. April 30th Tohmajärvi, Judge Mrs Annamaria Tarjan from Hungary. 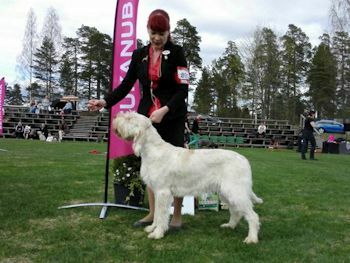 BOS CC cacib Northgate's Read All About It "Kaiku"
Riipi The Spinone was BOB & BOB-veteran. 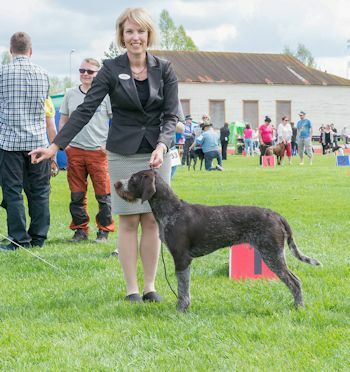 German Wirehaired Pointer Rikurovan Iira was BOB with CC & cacib and got Finnish Champion title! 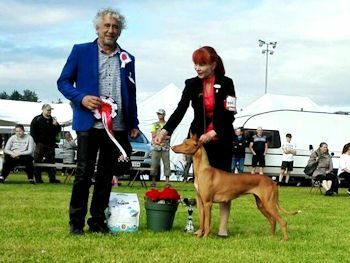 Rikurovan Iira Group-2, judge Mr Raimo Louhio. 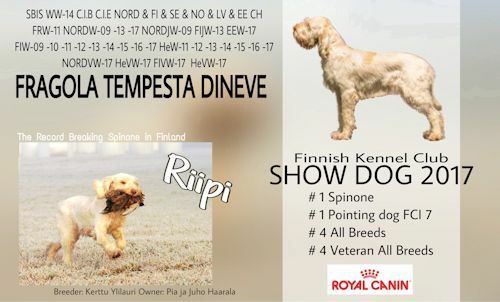 Spinone Riipi (Fragola Tempeste Dineve) BIS-3 veteran judge Mr Tapio Eerola. 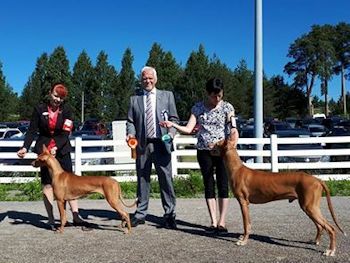 Northgate's Pharaoh Hounds BIS-3 judge Mr Kimmo Mustonen. 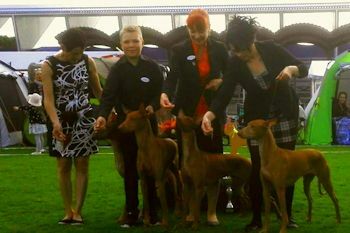 BOB CC cacib Northgate's Red Riding Hood "Redi"
BB3 BOB-JUNIOR NCM'S All That Glitters Is Gold At Northgate "Glitter"
BB4 Northgate's Northside Special "Britney"
BOS cacib Northgate's Price Charming "Manu"
BM2 CC Northgate's Rock The World "Sergei"
At the group finals Glitter Best In Show 2 Junior from a huge amount of juniors! 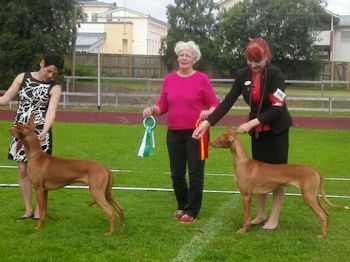 Fragola Tempesta Dineve "Riipi" BOB & BOB-vet judge Mr Pekka Teini. 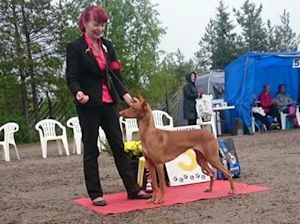 At the group finals she was placed as BIG-3 by Mrs Jetta Tschokkinen. 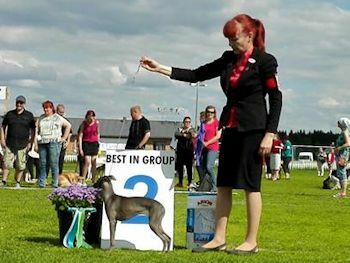 And Italian Greyhound Stella, Dervisch Sixteen Shades of Blue, BOB cacib, judge Mrs Maija Lehtonen. 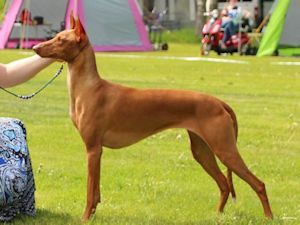 BOB CC BIG-4 NCM's All That Glitters Is Gold At Northgate "Glitter"
BOS CC Northgate's Rock The World "Sergei"
BOB CC cacib Northgate's Rock The World "Sergei"
BM-3 BOB-veteran BIS-2-veteran Northgate's Forever N Ever "Enzo"
BB-3 NCM'S All That Glitters Is Gold At Northgate "Glitter"
At the group finals Northgate's Pharaoh Hounds Best In Show breeder!! Thank you Mr Veli-Pekka Kumpumäki! 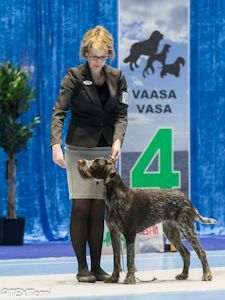 At the group Finals Mr Markku Kipinä placed her as BIG-4! Martin Hansen (group). 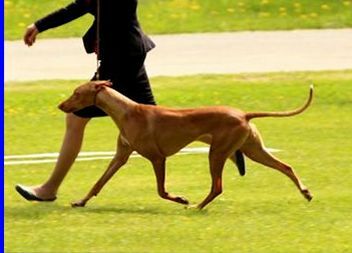 She was also short listed at BIS veteran. 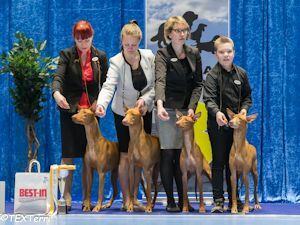 BM3 Northgate's King of the Ring "Qezo"
BOS CC NCM'S All That Glitters Is Gold At Northgate "Glitter"
BB-2 cacib Northgate's Rock Princess "Roxy"
BB2 Cacib Northgate's Rock Princess "Roxy"
BIS-2 breeder Northgate's. 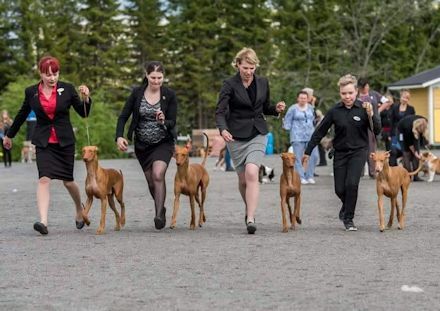 Photo Mr Pekka Teini.